With some time on my hand, I decided to explore HKIA after arriving via the Airport Express during my last visit to Hong Kong. I really haven’t had the chance to go around the airport in my previous trips particularly because I had to transfer between connecting flights. 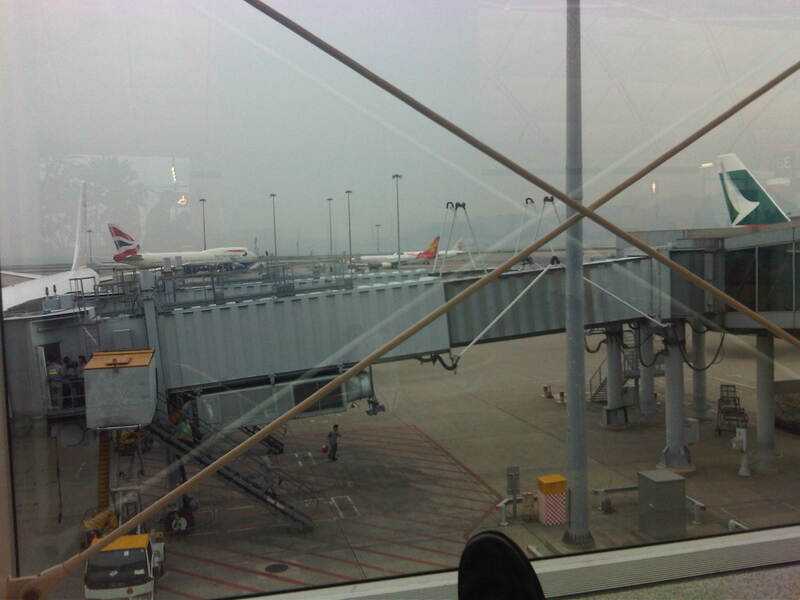 Following are a few photos at the HKIA taken last December 2012. Shops at HKIA include branches of luxury brands. They also have Disney stores at the terminals. Travelers can easily go around the airport terminals and information such as those shown in the photo are found in strategic locations around the terminal. Taking a train ride to the satellite terminal where my boarding gate was located, I took a photo of the interior of the vehicle. 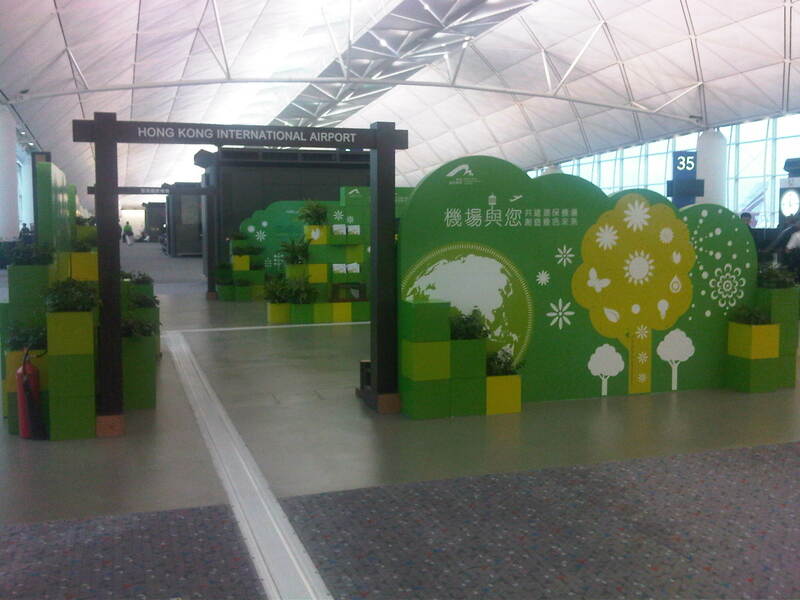 HKIA was promoting environmental awareness the last time I was there. 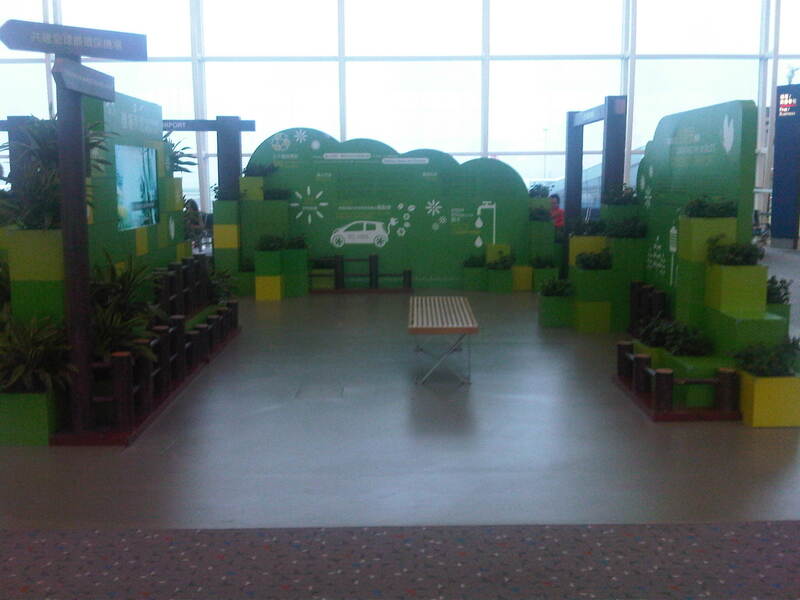 Travelers, particularly children, can have a quick look and learn about the environment in this set-up inside the terminal. Expansive interiors of HKIA departures level makes people appreciate the space. For a very busy airport, HKIA does not look congested once you are inside the terminal. A photo of the tarmac taken while I was reclining on what I though was perhaps among the most comfortable chairs in an airport terminal. I was lucky have found one unoccupied and quite selfishly used it until our boarding call. I think HKIA is indeed one of the best airports in the world. For me, it is a toss-up between HKIA and Singapore’s Changi for the top spot, even considering that Changi had a Budget Terminal. That terminal is now giving way to a larger Terminal 4, which has much expectations riding on it given the airport’s standing. Not to denigrate HKIA, which I think has better shopping and dining than Changi but there might be other factors where Singapore’s airport is better than HKIA? Another revolution needed along EDSA? February 26, 2013 10:19 pm / 1 Comment on Another revolution needed along EDSA? One of the most powerful images of EDSA that sticks to anyone’s mind is one where you see hundreds of thousands of people occupying the sections near what is now a shrine dedicated to the People Power Revolution that led to the ouster of Ferdinand Marcos in 1986. Perhaps a more recent version of this image is another associated with a People Power 2 that ended the term of another Philippine President, Erap Estrada, in 2001. The latter had in the background the newly operational MRT-3 as well as the overpasses at the intersection of EDSA-Ortigas that were built after 1986. These images are now mostly replaced by those depicting EDSA as one huge parking lot for cars during peak periods that seem to stretch beyond the typical morning and afternoon hours. A couple of photos are reproduced below showing day time and night time traffic congestion along the stretch of EDSA from Ortigas to Camp Aguinaldo. Afternoon congestion along the section of EDSA between Ortigas and Santolan. Note that even the overpasses are full of vehicles. Camp Aguinaldo is the green area on the top right. Traffic congestion along the same section of EDSA at night. The head and tail lights represent the motor vehicles crawling along the highway. Already the Metropolitan Manila Development Authority (MMDA) has tried so many schemes along EDSA but mostly to regulate bus traffic. These have included various versions of dispatching schemes including a failed foray into the use of RFIDs. The current system that was launched in January is another attempt that we hope to be more successful than the previous ones. Already, the system has been able to weed out drivers with multiple traffic violations. There are many more of these drivers behind the wheels of public transport vehicles who probably shouldn’t be driving such vehicles as they put their passengers at risk of being involved in road crashes. Incidentally, such traffic violations associated with the different private bus companies operating in Metro Manila have been the subject of an interesting discussion during one congressional inquiry on public transport franchises where the MMDA reported hundreds if not thousands of traffic violations attributed to various bus companies. 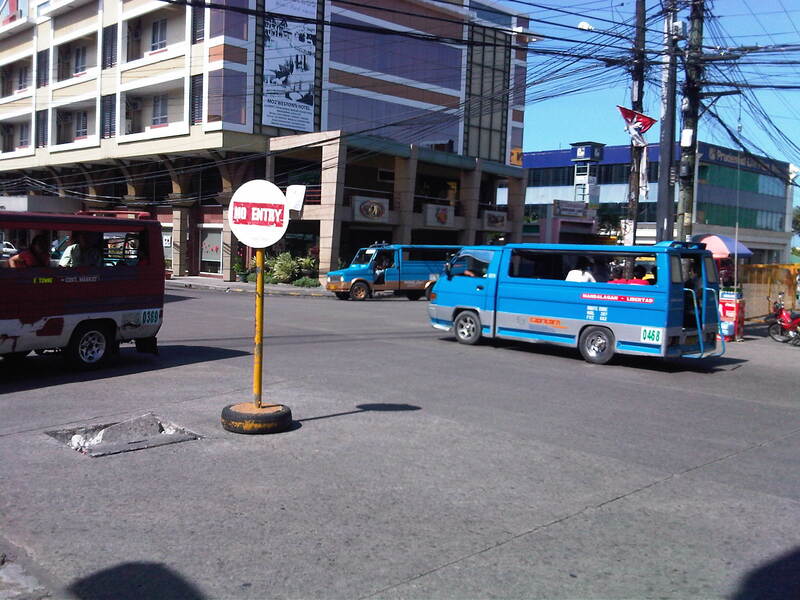 The MMDA is limited by its mandate in so far as buses are concerned. It is the Land Transportation Franchising and Regulatory Board (LTFRB), which has the responsibility to address franchise violations and enforce rules in such a way that the agency could influence bus companies to improve their services. However, the MMDA is not at all helpless here as they are in the best position to petition for sanctions against erring bus companies based on their data on traffic violations. Such obviously constitute a violation in the franchise particularly where reckless or irresponsible driving exposes their passengers and the general public to risks in the form of road crashes. Such crashes can translate into losses of lives, injuries or significant damages to property. The Department of Public Works and Highways (DPWH) has proposed an elevated highway on top of EDSA. This is supposed to have been inspired by similar elevated expressways found in other principal metropolitan areas including those in Tokyo. Would it solve the problem of traffic along EDSA? Probably in the short run after its opening but likely not in the long run as the elevated highway will rapidly become congested much like the experience with C-5. An elevated highway will also require ramps at many of EDSA’s intersections with other major highways and congested on the ground will lead to the condition spreading to the elevated sections. The planned rehabilitation of EDSA is overdue. However, it has met a lot of opposition and mixed signals from various sectors including the MMDA itself, which is supposed to work with the DPWH in finding a solution for Metro Manila’s busiest thoroughfare. It seems that the MMDA is perhaps more interested in pursuing another elevated highway project, the Skybridge, which would be along a corridor on top of the San Juan River. Curiously, the objective of this other proposal is to have another alternate route to EDSA or simply “to decongest EDSA.” While well meaning, I have the gut feeling it won’t have a tremendous impact as it will still cater mainly to private cars. How about the commuters who comprise 70 to 80 percent of travelers along EDSA but only have about 30 percent of the road? We have to realize that only by keeping people, who do not need to drive, on public transport can we effectively decongest our roads. It is when they start using cars or motorcycles that our road space become all the more limited. Meanwhile, the Department of Transportation and Communications (DOTC), the agency which is supposed to come up with the solutions to our transport problems has not been as active as it should be on the topic of EDSA. To be fair, the agency seems to be working on the acquisition of additional coaches to address the also overdue capacity expansion for the MRT Line 3. However, it also seems that now worries that the line was poorly planned in the sense that it failed to anticipate the present transport demand, has been validated. MRT Line 3 is really a light rail transit line that was built along EDSA despite the need for a higher capacity system. But is it too late to upgrade this system? Or do we need another to supplement or complement the MRT 3? Perhaps what is needed along EDSA is another revolution but one of the sustainable transport kind. “Sobra na! Tama na! Palitan na!” were cries in 1986 that are now very much applicable to the transport system we have along EDSA. It will not be an easy nor an inexpensive task to upgrade the MRT-3 into a higher capacity system required along this corridor. But opportunities are now available to ease the burden along the line. The emergence of bus rapid transit (BRT) as a viable option along EDSA would have to be explored. But a BRT cannot be simply installed along the corridor. The government would also have to be firm with the conventional buses plying routes that all seem to be overlapping along EDSA. These routes would have to be simplified along with the numerous companies that would have to be encouraged to form consortia (or cooperatives?) that can participate in a MRT-BRT-bus integrated network. The question now is who will champion or lead such a revolution for transport? Who will be progressive enough to lead us into an era of modern transport that should be inclusive, environment-friendly, and promotes “dignity of travel” for all? This time last year, the wife and I were on a trip to Malaysia to explore the old city of Melaka. 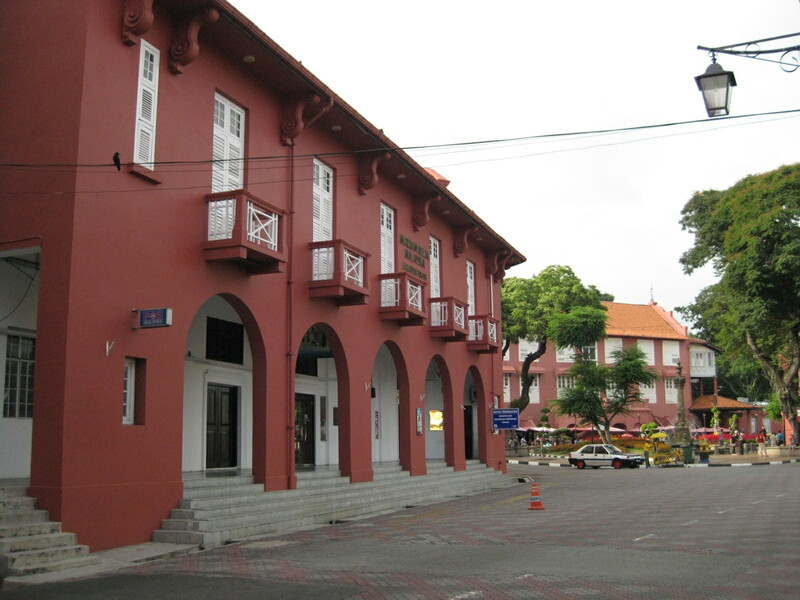 What was once known as Malacca has been under different colonizers from the Portuguese to the Dutch and finally the British. In history we now know that when the Spanish and Portuguese divided this part of Asia between them, the Portuguese got Melaka while the Spanish got Manila. 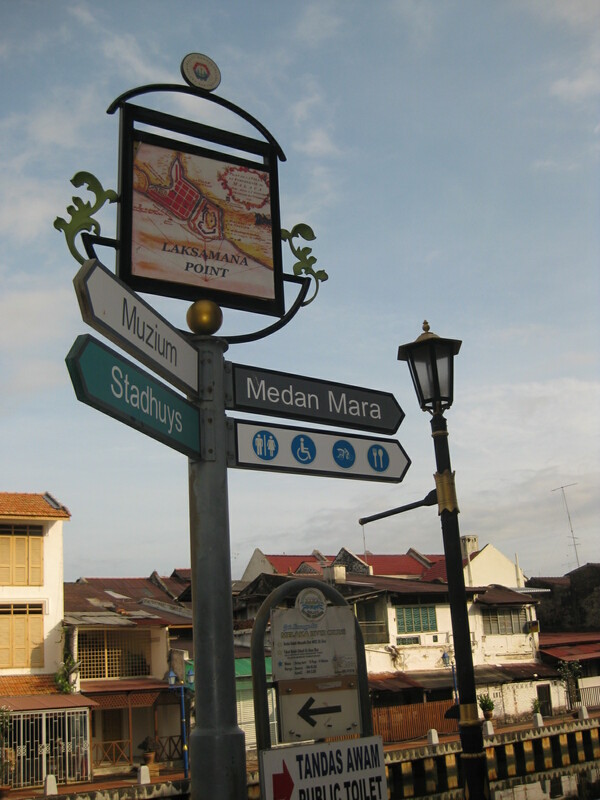 Melaka was important due to the spices that were an important part of trade in Europe at the time. 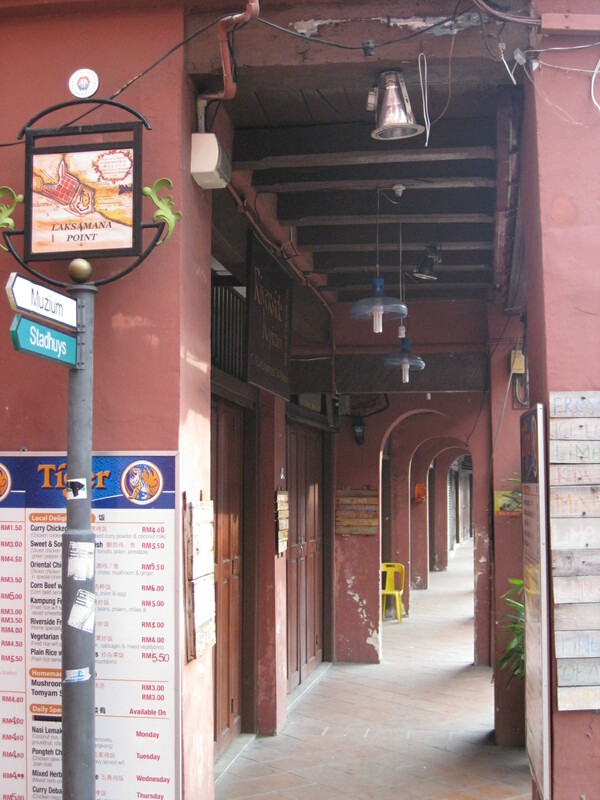 I post below a part of the series on the Melaka trip that I wrote for another blog. Walking towards the church of St. Francis Xavier from the plaza of Christ Church, the walkways reminded me a lot of similar forms back home in Manila, Cebu and Iloilo. 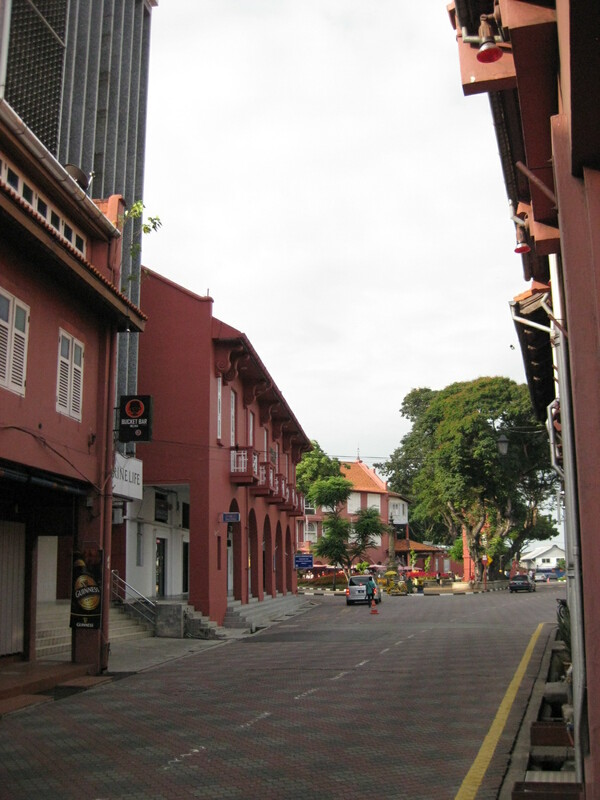 The latter were old cities “founded” during the Spanish era just about the same time Melaka came under Portuguese rule. Much of the designs of course were not from those times but more recent, perhaps when the Philippines was under the United States and Malaysia under Britain. I can only imagine how beautiful our cities could have been if we were careful about development and making an honest effort towards heritage preservation. Similar walkways in many of our cities are now jammed with vendors, beggars and are poorly maintained (e.g., garbage and other dirt or grime everywhere). There is hope, however, as I have seen similar streets in Bacolod City that are clean and pedestrian-friendly. I will feature this in a future post. 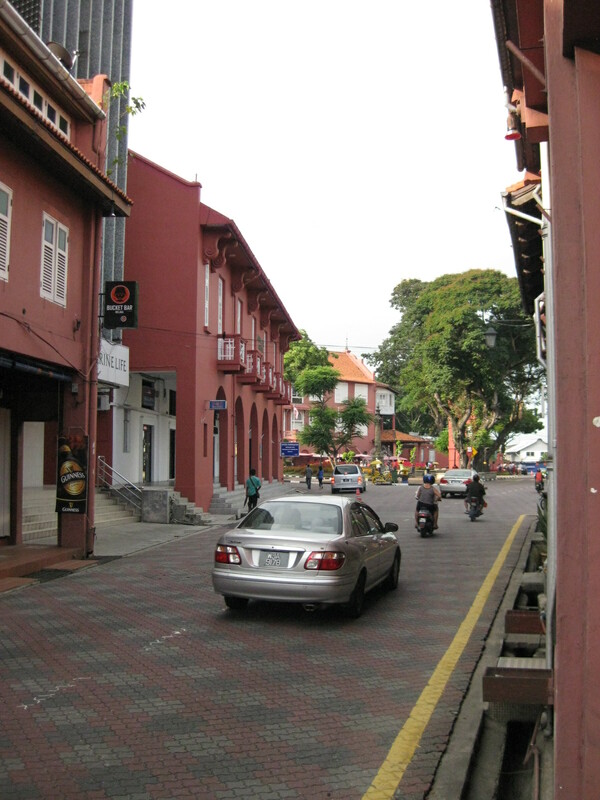 Meanwhile, the photos below were all taken in Melaka. 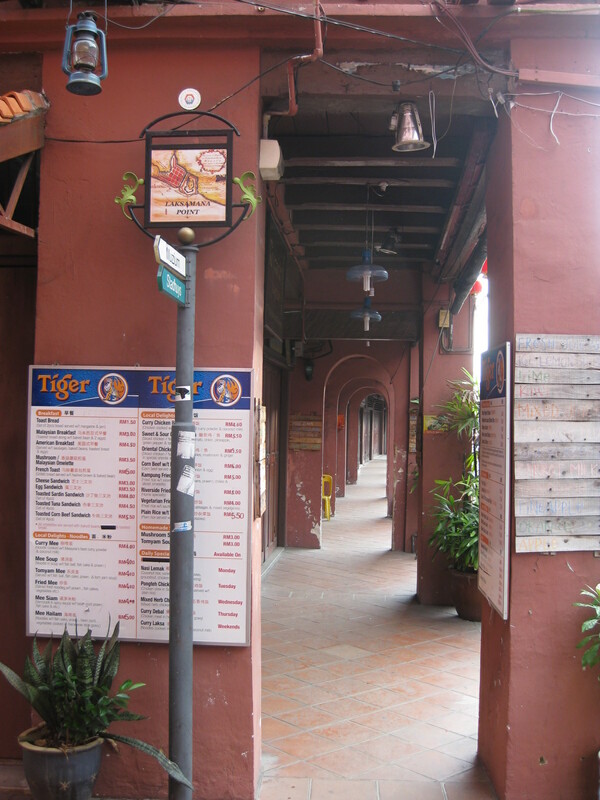 The walkways reminded me of similar forms in Manila, Cebu and Iloilo, all old cities established during the Spanish Period when Melaka was under the rival Portuguese. Traffic was light so one could get a good shot of the street leading up to the plaza. The street leading to St. Francis Xavier made me imagine how old cities in the Philippines would have looked like if those cities made an effort to preserve heritage and controlled motor vehicle access to their street. Some buildings have been converted to restaurants and bars but they retained their nostalgic features and feel. Another shot of the seemingly endless walkway beneath the buildings. After recently going around a similar historic area in Manila and seeing how neglected it has been despite its potential for heritage tourism, I can only imagine what it would take for Manila to revitalize Intramuros to attain something that Melaka has been able to do for its old quarters. Much has been said about our apparent or perceived lack of a sense of history and this seem to extend to how we have not been able to preserve many if not much of the old districts in many of our cities. Sayang! The streets surrounding the Bacolod Public Plaza are one-way streets following a counter-clockwise circulation around the plaza. Typical of plazas of old, the latter has around it the church (in this case San Sebastian Cathedral), the old city hall, commercial establishments, the police headquarters, and a major school (La Consolacion College). The following photos were actually taken a year ago in February 2012. I doubt if much has changed since then but the circulation and traffic situation should practically be the same give and take the normal traffic growth due to progress for the capital city of Negros Occidental. Roadside parking along San Juan St. Noticeable above are the motorcycle parked along the road, with some occupying pedestrian crossing space. 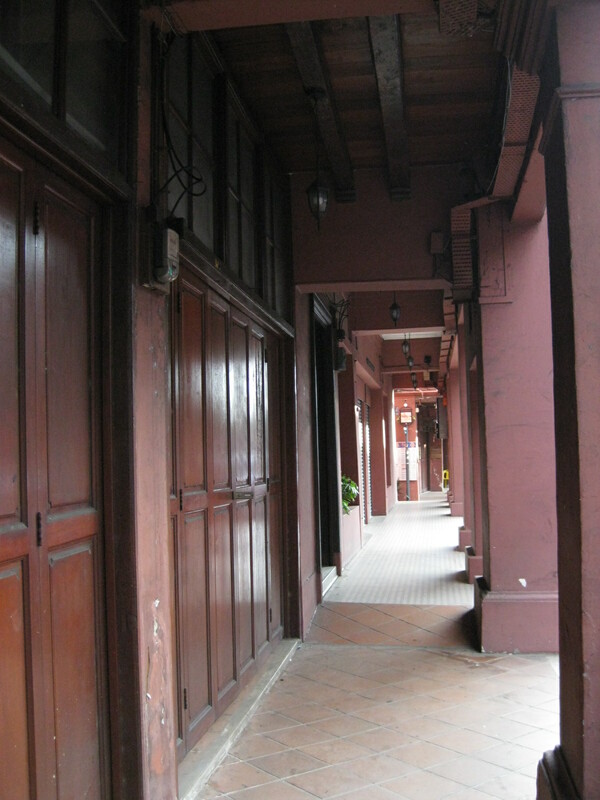 Old cities like Bacolod have buildings featuring arcades like this where pedestrians have the ROW and are sheltered from the elements. I was glad to see that the city basically cleared these facilities from obstacles. It is not entirely without impediments though as shown in the photo. Steel barriers along Rizal Street prevent vehicles crossing the street from the northeast side of San Juan St. All traffic must turn right towards SM. (view from the corner of San Juan and Rizal along San Juan towards the southwest direction) The PNP headquarters is the building on the opposite corner with the blue roof. 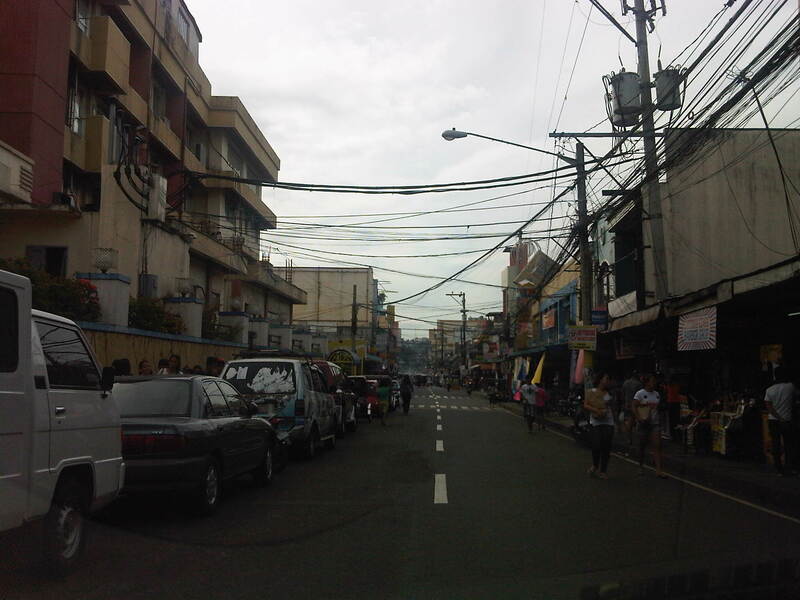 Luzuriaga Street is also a one-way street and with significant roadside parking as shown in the left side of the photo. View of traffic coming from the intersection with San Juan St. Westown Hotel is the building at left. The circulation scheme at the plaza seems to be working out well at the time. This is despite the proliferation of roadside parking along the streets and around the plaza. 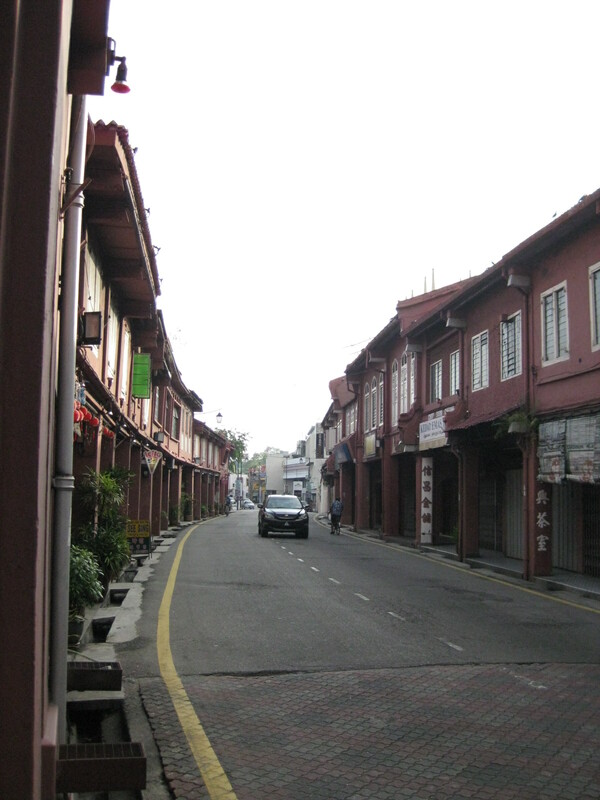 The streets are relatively wide and so a one-way scheme works well in terms of taking advantage of the capacities of the streets while allowing for curbside parking that typically occupies one lane of road space as shown in the photos above. We didn’t see anyone charging parking fees for the vehicles and so we assume that these are practically free though we did see some informal “watch-your-car” boys who rely on tips from those parking along the road. Ultimately, though, the city should look into the provision off-street parking facilities as I can imagine traffic congestion, for example, in the vicinity of San Sebastian Cathedral on Sundays. Traffic in the area should be expected to increase as the city continues to experience economic growth and more developments ultimately locate at the reclamation area. Road travelers are welcomed by arches found at the boundaries of cities and municipalities. These are commonly seen along national roads and often reflect the character, history or product for which the city is known for. 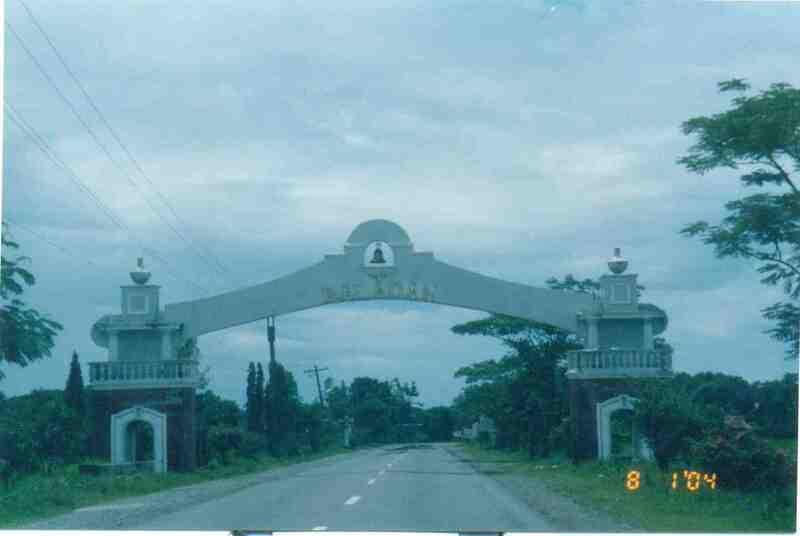 The town of Paniqui, Tarlac has a bat featured in its arch while Castillejos, Zambales includes a castle. I stumbled into a lot of old photos recently. Well, probably not so old considering they were taken in 2004 during the time we were implementing nationwide surveys for passenger and freight flow. As our group was assigned to do surveys along McArthur Highway from Tarlac to Ilocos Sur, I frequently took photos using the old Pentax camera I bought during my first visit to Japan in 1996. In 2004, digital cameras were still quite expensive and so were cell phones with cameras. It was cheaper to buy film and have it developed and photos printed. In my case, I usually bought a lot of film when I traveled to Tokyo (it’s cheaper there) and I carried a few rolls whenever I went on trips. The prints I discovered were taken along the national road while we were traveling from La Union to Ilocos Sur. 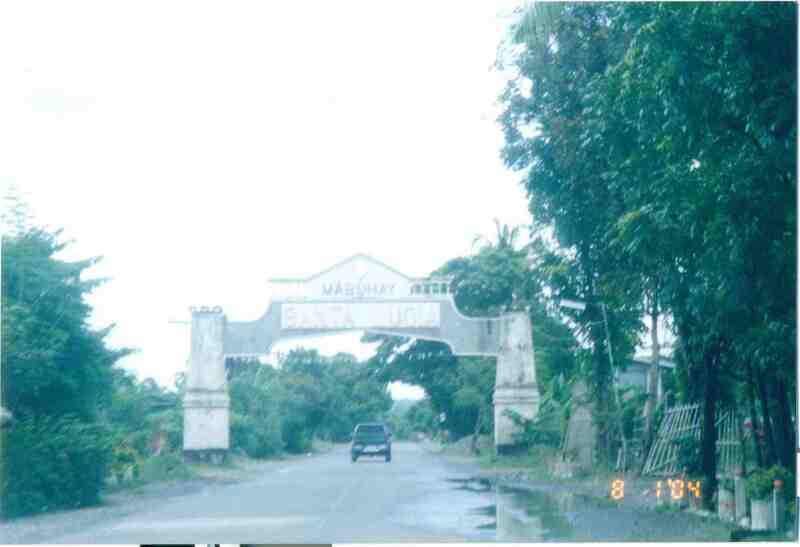 Many of the photos showed arches of towns that I took note of as we proceeded to Vigan. I think I may have missed some but checking the maps I believe I was able to catch most of the arches between Agoo, La Union and Santa, Ilocos Sur. “All roads lead to Antipolo” is a saying that is especially true for devotees to Our Lady of Peace and Good Voyage for whom the shrine in Antipolo is dedicated. Indeed, major transport routes lead to Antipolo City and signboards on jeepneys (and buses of old) state “Antipolo Simbahan” as their destination. In much older days, the Manila Railroad Company used to have trains directly serving this route. The remnants of its right-of-way is still there but in the form of roads. These are the Daang Bakal, which stretches from Valley Golf in Cainta, Rizal until its junction with Taktak Road and Ninoy Aquino Blvd., where it becomes the Lorenzo Sumulong Memorial Circle, Antipolo’s circumferential road. A trace of this old railway line may be found in this previous post. From J.P. Rizal Street, which extends from Sumulong Highway, one turns left to head straight towards the Antipolo church along P. Oliveros Street. The street is a two-lane, one-way road that has been widened at some sections. The shoulders, however, are mostly used for parking as shown in the photo. The dome of the church becomes visible to the traveler as one comes closer. 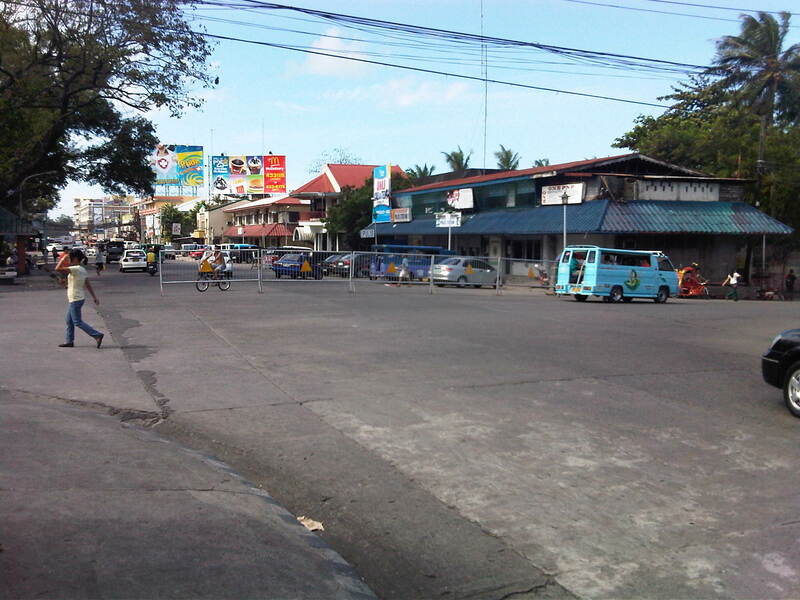 P. Oliveros St. is closed to traffic during the feast day in May. It is usually open during Lent even during the Holy Week when there are lots of people coming to Antipolo for the Visita Iglesia. Traffic during those times can be quite slow because there are also lots of people walking along the streets, many of whom are devotees who are namamanata, or have promises of sacrifice and prayers to the patron of the shrine. Similar to other poblacions around the country, commerce surrounds the church. Antipolo receives thousands of visitors daily and its being a natural traffic generator provides opportunities for businesses to thrive around it. Establishments around the church are proof of this and one will find most major fast food chains within a stone’s throw away from the shrine. In the photo are major chains Jollibee, Mang Inasal, Greenwich along the right and Mercury Drug(not fast food but the largest drug store chain in the Philippines) and McDonald’s on the left. There are more including banks and food stalls along M.L. Quezon Street, which is the main street of the poblacion. M.L. Quezon Street in front of the shrine and the main street of the poblacion, is also a two-lane, one-way street (southbound flow). There are many one-way streets here as it is no longer possible to widen streets. One side of M.L. Quezon is used for parking and a short walk from the church is Antipolo City Hall, which is the red building barely visible (obscured by the tree on the left) downstream in the photo. 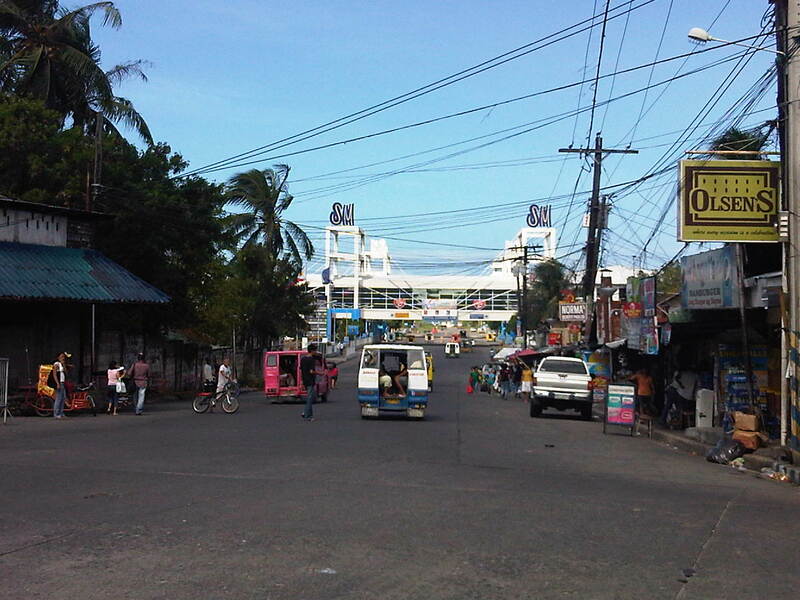 The Antipolo City Hall building is seen here at the left in this photo. It would be nice to see the poblacion re-planned, designed and managed so that walking may be given primacy over other modes, particularly motorized ones. Antipolo should be walkable and it was in the past considering there were no tricycles and automobiles during the Spanish and early American periods. One took an animal-drawn vehicle, road a horse, or walked even when there was a train service in the early part of the last century. If parking is an issue, then perhaps the city, with the cooperation of the private sector, could find ways of building multi-storey parking facilities in the periphery and within comfortable walking distance from the shrine and city hall. There’s much potential here that is steadily being wasted due to traffic and with no design theme even for buildings surrounding the shrine. The shrine represents heritage and to preserve and enhance it, Antipolo City should find ways to introduce sustainable transport as well as applying architectural principles for the poblacion. More than 2 years ago, the current administration made an inspired move after the President mentioned in his inaugural speech that he was among those who didn’t like “wangwang” (sirens) and associated these with abusiveness, of feelings of entitlement among road users. The use of sirens and other similar devices tells people that the user is an “important” person whose time is more valuable than others. Whatever happened to the drive against “wangwang” in all its forms? The proliferation of commemorative plates, for one, can be a form of “wangwang.” While the Land Transportation Office (LTO) came up with a memo a few years ago providing clear instructions on how the commemorative plate should be displayed (i.e., on top or above the legal plate), many have returned to the practice of replacing the license plate (hiding it) with the commemorative one. This is especially true for those plates bearing police, military, government, and other agencies or organizations that can be used to make traffic enforcers think twice about apprehending a motorist for legitimate traffic violations. One sees such plates everywhere screaming “PNP,” “CIDG,” “NBI,” “PMA,” “Prosecutor,” “Councilor,” etc. and you know these are statements that are meant to intimidate traffic enforcers, which is often denied by the guilty party. 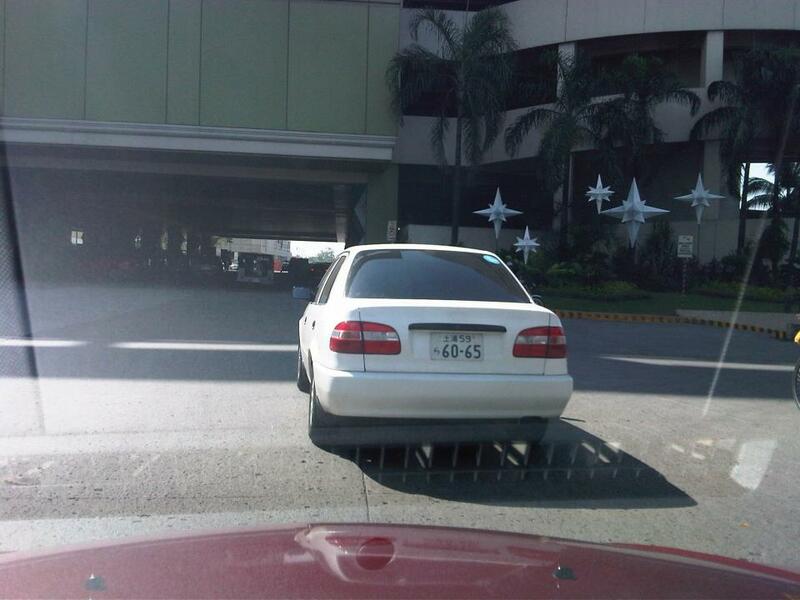 Then there is also the abuse of special plates, particularly those supposedly assigned to lawmakers. How many people have “8” as their license plates? Do children or staff of senators and congressmen enjoy the same privileges as the elected official? In the past, plates bearing “8” also indicated the district represented by the person supposedly using the vehicle. And so you would know, for example, if the person happens to be from the 1st District of Iloilo or the 3rd District of Quezon City. The same goes for vehicles bearing “16” and other special plates indicating someone holding a high position in government. Nowadays, even family members and staff members of these officials use the special plates, thereby extending to them the courtesies usually given to elected or appointed officials like not being covered by the number coding scheme in Metro Manila. This should not be the case for such “extensions” if we are to enforce the law firmly and fairly. In certain cases, worse are those who use neither license plates or authorized commemorative ones. There seems to be a proliferation of people using personalized, souvenir or replica plates from other countries. These are often used in lieu of the rear license plates. These are claimed to be harmless since traffic enforcers usually check only the front plates for registration and compliance to number coding. However, there are implications for when the driver and the vehicle are involved in incidents such as traffic violations or crashes (e.g., hit and run incidents). While witnesses would probably be able to describe the car, the license plate cannot be recorded. Therefore, it would be quite difficult to trace the vehicle’s ownership information that could be retrieved from the LTO’s computer records to identify the violator or suspect in an incident. The legal plate is deliberately obscured on this one as it is hidden in the rear bumper. This one thinks he’s driving in Japan. Perhaps the LTO and traffic enforcers who are deputized by the agency should also clamp down on these cases of violating RA 4136. The idea is to have a campaign similar to what was implemented to rid our roads of the annoying “wangwang” back in 2010. Such an initiative should help promote discipline on our roads in the sense that motorists would be more aware of traffic rules and regulations and that they cannot continue trying to circumvent basic laws.